Today's manicure has a dual purpose. 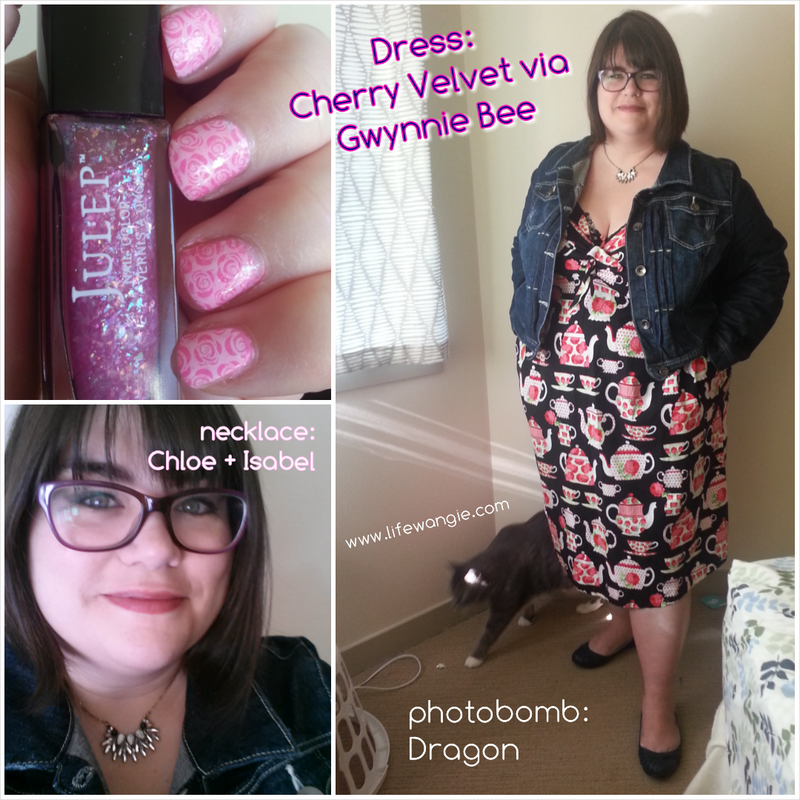 It was inspired by my outfit, which was a really cute Cherry Velvet dress that I got through Gwynnie Bee, a plus size clothing rental/borrowing service. I'm going to do a full post on Gwynnie Bee soon, but just so you know, I love it, so I became an affiliate, and they have a special right now where if you use my link, you get your first month for $10! The other purpose was to kick off October, Breast Cancer Awareness month and participate in an Adventures in Stamping Sunday challenge to do a mani with a pink base. Here is the outfit that inspired the manicure. Isn't it cute?? It's super comfortable and has pockets. The only thing to watch is it is a bit low-cut. 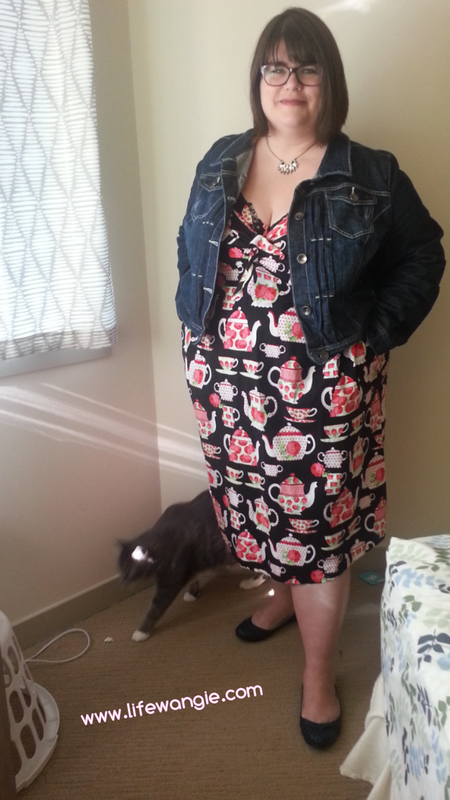 I love the teapots all over the dress, and I took inspiration from the roses. Manicure after the jump. 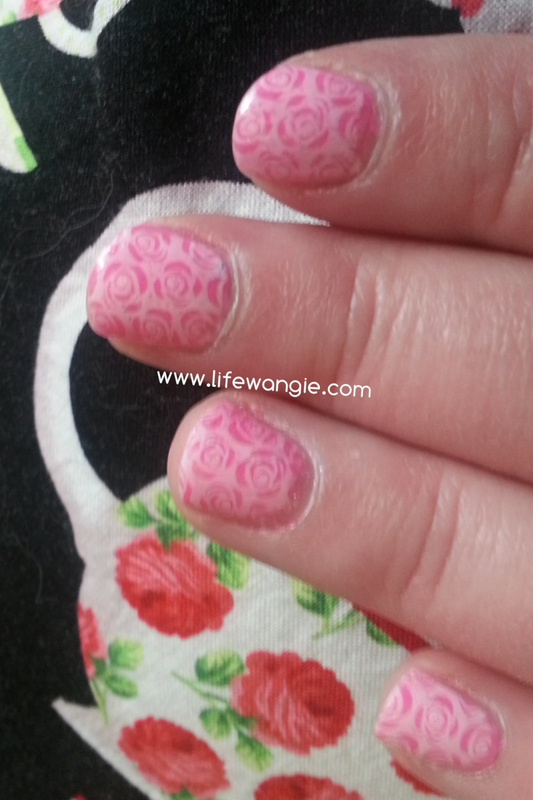 I wanted to recreate the roses in this dress, and I think the stamping plate I have used the most is my MoYou London Pro Collection - 04. The two rose designs on the bottom row are my faves and I have used them over and over. This time I used the reverse one in the bottom right corner. Doesn't it go great with the dress? I love it. Using Lindy as a topper created a sort of stampwich effect - as you can see, the white is colored the barest of pinks by the jelly. The flakies in Lindy aren't that intense, which would be disappointing if you were going for a super flaky look. But is good in this case, because I wanted the stamping to show through. Overall I was super happy with the way this whole look came out. I had a brunch to go to today with my fellow regional Chloe + Isabel merchandisers, and it was fun to wear this look. That 's a very cute outfit! Love the nails too.